Firm offering tax, accounting, and business consulting services. Based in Scottsdale. Based in Scottsdale/Phoenix Area. bicycle wheel lights. scottsdale, az. 11 Hacienda Harley-Davidson/Buell Scottsdale, Arizona. Public videoconference facility in Scottsdale, AZ. Services offered, gallery and email contact. Providing mortgage and finance solutions for Scottsdale and all of Arizona. Errand and traveling PA service for the Phoenix/Scottsdale area, Arizona, USA. Video courses for acupuncture re-certification. Offered in Scottsdale, Arizona. Architectural services for residential and commercial clients. Located in Scottsdale. Profile, portfolio and contact information provided. Located in Scottsdale. Displays website, interface, corporate identity, and print portfolio. Located in Scottsdale. Includes services, porfolio, pricing and contact information. Located in Scottsdale. 23 Helland Photography Scottsdale Arizona. Scottsdale Arizona. Includes photo galleries and contact information. Services offered, portfolios and contacts. Located in Scottsdale. Architecture, planning and interior design firm located in Scottsdale. Modern high-end residential and small commercial projects. Located in Scottsdale. Biography, services offered, awards, publications, projects and contacts. Located in Scottsdale. Services, portfolio, bio, history, publications, awards and contact information. Located in Scottsdale. Meeting management and event planning services from site selection to turning out the lights. Scottsdale, AZ. Multi-disciplinary architectural,planning and interior design firm headquartered in Scottsdale. Portfolio, services offered, company profile and contact information. Located in Scottsdale. Ed Hammond builds prosperity, profits, enjoyment and performance excellence for individuals and organizations using a multitasking method. Scottsdale, AZ. Serves Scottsdale and the surrounding areas, includes qualifications, details on services, fees, and order tracking. Featured are services offered, portfolio, philosophy and contact information. Located in Scottsdale. Mediator provides solutions for homeowners. Includes services, questions and answers, company information. Offices in Scottsdale, AZ and Portland, OR. 39 Management Recruiters of Scottsdale. Animation, graphics, drawings, cartoons, illustrations, paintings, and photos from multimedia artist based in Scottsdale, Arizona. A personal concierge and errand company servicing busy clientele in Paradise Valley, Scottsdale, and the surrounding Phoenix areas. Firm assists companies in achieving excellence in marketing, sales and customer service execution. Located in Scottsdale, AZ. Scottsdale full-service CPAs emphasizing business development counseling, audit, and tax preparation services. Business and marketing writer specializing in articles, white papers, case studies, press releases, etc. Based in Scottsdale, AZ. Provides errand running and personal assistant services for both individuals and businesses. Serving North Scottsdale and surrounding areas. Fully insured. Arizona-based mortgage broker with branch locations in Phoenix and Scottsdale. Wedding, and portrait photography in the Scottsdale-Phoenix area. Personalized golf clubs sales and contact information. Providing complete mortgage services in Scottsdale and throughout Arizona. Scottsdale, AZ company distributing flyers and promotional items. Located in Scottsdale. Details the Bajaromethod of interior design. Offering design services for both print and web applications. Provides work samples. Located in Scottsdale. 53 Rick Mueller Photography Portrait Photography. Portrait Photography. Located in Scottsdale, AZ. Digital traditional and candid photography in Scottsdale. Includes business profile, awards, featured publications, portfolio and contacts. Locations in Scottsdale, Arizona and Greenbrae, California, USA. Providing both national and international executive protection. Specializes in corporate, celebrity, death threats and stalking. Based in Scottsdale, Arizona. Also offers material specifications, architectural detailing and custom furnishings. Shown is business profile, services, portfolio, showroom information and contacts. Located in Scottsdale. Details on services, mortgage rates and applications, and payment calculator. Based in Scottsdale. Scottsdale, Arizona area euro cabinetry showroom. Offers design services, cabinetry and installation. Arizona mortgage broker serving Scottsdale, Paradise Valley, and the Phoenix Metropolitan area. Writing and editing with an emphasis on corporate marketing and public relations materials. Site includes background, services, contact information. Scottsdale, Arizona. Commercial sheet-fed printers with pre-press, political, and direct mail services. Located in Plainview, with sales offices in New York City and Scottsdale, Arizona. designs builds and operates outsourced data center facilities and colocation services in phoenix/scottsdale, arizona. developing and marketing products for professional and home use, with company background and details of training seminars. scottsdale, arizona, usa. Provides no-charge site selection services to corporate, association and government clients that plan off-site meetings and conferences. Based in Scottsdale, Arizona. Provides assistance in the areas of leadership skills, partnering, teambuilding, project management, and strategic planning. Located in Scottsdale, Arizona. Licensing and broker courses. Features schedule, testing times, specialty courses. Located in Scottsdale, AZ. Consultation, training and program development for improving gender communications and management. Company background, programs and articles. Offers instruction for the mortgage industry in online and classroom formats. Includes school overview and available courses. Located in Scottsdale, AZ. Provides comprehensive sign design and fabrication for commercial and residential developments. Site includes extensive portfolio and contact information. Scottsdale, Arizona. Design services include branding and identity, print collateral, packaging and interactive media. Provides client list and portfolio. Based in Scottsdale. Scottsdale practitioner offering tax services and financial planning, focusing on Federal, California, and Arizona matters. Includes newsletter, description of services, biography, and tax tips. providing helicopter charters, tours, maintenance, repairs and heligolf. featuring american eurocopter a-star and twin star helicopters. located in scottsdale, arizona. Virtual assistance, including but not limited to travel arrangements, reminder service, typing, word processing, software training, and web design. Based in Scottsdale, Arizona. Designs, manufactures, and installs custom signs and vinyl printed banners for a wide variety of indoor and outdoor signage applications. Phoenix and Scottsdale, Arizona. prescription drugs for treatment of pediatric asthma, podiatric fungal infections, and dermatological conditions, including acne, eczema, and hyperpigmentation. profile of products and company headquartered in scottsdale, arizona. Includes history, menu, locations, and information on employment and contact. Locations in Scottsdale, Arizona, Irvine and Newport Beach, California, and Salt Lake City, Utah. Design company in Scottsdale offering web design and hosting, print design including corporate identity packages, and multimedia CD-ROM development. Portfolio and services description. Residential, commercial, master planning, public works and hospitality design services. Offices in Scottsdale and Sedona. based in scottsdale, arizona providing an on-demand fleet of jet aircraft for corporate or private flights. shows map of range of aircraft and promotional video. Scottsdale based agency provides details on home and land valuation services, includes details on services, legal notices, and order form. Full-service production services for concerts, conferences, festivals and events. Sound, lighting, stages, personnel, and power generators. Serves the Western US, based in Scottsdale Arizona. Visual communications solutions including corporate identity, print brochures, and environmental design and signage from Scottsdale, Arizona designer Jim Rowley. Portfolio and bio. A professional recording studio and production company specializing in demos and albums. Features ProTools HD. Offers internet radio stations, marketing, promotion, and other musician services. Based in Scottsdale, Arizona, USA. Specializes in the interior design and market-driven merchandising of model homes. Portfolio, business information, services offered and contacts. Located in Scottsdale. Directional drilling contractor based in Scottsdale, Arizona. Management consulting specific to training and documentation for e-learning, live instruction, documentation, web site content development and corporate learning consultation. Based in Scottsdale, Arizona. A full-service agency specializing in traditional recruitment, on-line recruitment and all forms of help wanted advertising. Based in Livingston, New Jersey, USA with offices in Philadelphia, PA, New York, NY, Scottsdale, AZ, Honolulu, HI, and Framingham, MA. Marketing, creative services and PR firm. Capabilities include media relations, crisis communications, event planning and sponsorships, graphic design, video production, outdoor media, package design, websites and promotional materials. Includes services, clients and contact information. Based in Scottsdale, AZ. Motorsports of Scottsdale, retailer in Panoz, Ferrari, Porsche, Aston Martin, BMW, Mercedes Benz, Bentley and Rolls Royce. Offers personalized engraved clubs and awards. Shoes, accessories and apparel for runners and walkers. Scottsdale shop delivery fresh designs, plants and gift baskets. Includes catalog of unique wedding arrangements. Arizona gallery offering sterling silver and gemstone jewelry, antique and collectable bead jewelry, artifacts and wedding accessories. Full-service shop offering fresh arrangements, plants and cactus gardens for delivery in Scottsdale, Paradise Valley and vicinities. National and international order transfer. Offers facial, moisturizing, wrinkle cream, lotion and cosmetic products. Plus an on-line simple evaluation questionnaire to help your selection and spa services in Scottsdale, AZ. Family owned florist shop offering fresh arrangements, plants and cactus gardens for delivery in Scottsdale, Paradise Valley and vicinities. National and international order transfer. Primarily sells name brand flip flops and sandals for men, women, and children. Retail and online sales, stores in Chandler, Phoenix and Scottsdale. An ob/gyn practice with offices in Scottsdale and Phoenix. Associated with Scottsdale Healthcare Hospital Osborn and Scottsdale Healthcare Hospital North. Official site for baseballs pre-season action in Scottsdale, Arizona. Dr. Kristen ORourke & Dr. Nathan Vitaro are licensed physicians practicing in Scottsdale, Arizona. They specialize in providing comphrensive healthcare to women and children. Office of physicians Thomas A. Kruzel, MT, ND, Cheryl M. Deroin, NMD, David A. Tallman, DC, ND, Suneil Jain, NMD, and Decker Weiss, NMD, FASA located in Scottsdale, Arizona. Recreational and competitive gymnastics programs. Gymnastics and cheerleading information. Located in Scottsdale. The Scottsdale Gun Club boasts a large indoor range and every Wednesday night turns it over to a USPSA match league (2nd and 4th Wednesdays) or IDPA match league (1st and 3rd Wednesdays). Show pictures and pedigrees. Scottsdale, Arizona. Tryouts, tournaments, photos. Phoenix/Scottsdale area. Photographs, memorials, pedigrees, and litter announcements. Scottsdale, Arizona. Provides breast augmentation to women. Phoenix, Scottsdale, and Mesa. OB/GYN practice in Scottsdale. Listing of services, location and hours. Strength training through the use of hydraulic resistance. Scottsdale and Casa Grande. Provides course information, directions and scorecard for members and guests. Scottsdale. Breeding West German bloodlines. Photographs and partial pedigrees. Scottsdale. Large indoor and outdoor fields in North Scottsdale and Phoenix. Offers a calendar, image gallery, activity, and contact information. A collection of photos taken at Scottsdale, Stanford and Acura Open 2002. Scottsdale 18-hole resort course. Scorecard and rates listed. Located in Scottsdale, Arizona, specializing in breeding and sales. Includes brief history of the breed. Dr. Mercedes Williams, N.D., Physician specializing in womens care practicing in Scottsdale, Arizona. Offering National Champion Arabians for breeding and sale. In Scottsdale. Non-profit aimed at supporting others with this condition. Headquartered in Scottsdale, Arizona. Includes schedules, scores, team photos, news, and a FAQ page. Company information, types of mounts, pricing, and contact form. Studio located in Scottsdale. Located in Scottsdale. Includes event list, membership application, and local area links. Breeder and trainer standing four stallions in Scottsdale. Lists stock for sale. Multilingual site offering details about this Scottsdale based acupunturist. Presents instruction overview, philosophy, packages, learning center, schedules and locations in AZ and VT.
Instruction in Tai Chi and Bunkai in Scottsdale. Includes articles, seminars, and school related information. Pete Dye designed 18-hole private course near Scottsdale. Course layout, scorecard, and membership information included. Physio-philosophy and ancient art of harmonizing the life energy in the body. Classes and training in Scottsdale, Arizona. Associate of Applied Science Degree and Certificate Programs in Massage Therapy. Located in Scottsdale, Arizona. List of services such as aesthetic surgery and laparoscopic hysterectomy. Directions and contact information located in Scottsdale. 141 Rose Garden Assisted Living Home Scottsdale, AZ. Scottsdale, AZ. Site includes a list of services, photos, contact information and a map. International holistic and metaphysical network of certified healers, lightworkers, body workers, intuitives. Scottsdale, Arizona. Offering champion Arabian horses for nearly 30 years, standing Mpulse++ and Scottsdale On-Fire. In Dousman. Features history, program and contact information, meeting schedule, list of upcoming events, and links. Evaluation and treatment of infertility and emotional aspects. Complete IVF facility located in Scottsdale. Features history, program and contact information, meeting schedule, a list of upcoming events, and links. Jack Nicklaus designed 18-hole course in Scottsdale. Amenities include pro shop, lessons, driving range, and putting course. Victoria Mogilner offers classes and retreats in Oriental alternative medicine. Scottsdale, Arizona. Features an image gallery, schedule and events, contact and advancement information. Chartered by the Desert Canyon Elementary School. Chartered by Our Lady of Perpetual Help School with pictures of the annual Pinewood and fishing derbies, calendar of events, and Scouting links. Horseback riding in Scottsdale near Phoenix, Arizona with trails in the Sonoran Desert. Details of rides, facilities and prices. Scottsdale. Offers the states largest indoor rock climbing gym. Includes details of facilities, events, photos, a forum, hours and directions. Based in Scottsdale. Two 18-hole courses. Lists rates, score card, pro shop, dining facilities, and specials. Includes club information, membership, activities, and pictures. Offers an introduction to the pack as well as a newsletter, policies and guidelines, history, and traditions. Information about Dr. Shapiro, procedures, skin care and his Scottsdale based surgery. 163 Clinical Endodontic Seminars Scottsdale Arizona. Scottsdale Arizona. Offering courses in Endodontics, Microsurgical Endodontics, and Conventional MicroEndodontics. Provides ambulance and emergency services to 450 communities across North America and Latin America. Based in Scottsdale. Anti-aging practice of Eli Hammer, M.D. Hormone replacement and diet programs. Located in Scottsdale, Arizona. Offers an introduction to the pack as well as a newsletter, policies and guidelines, history, and traditions. In the Grand Canyon Council. A Scottsdale, Arizona based clinc offering a wide range of aesthetic dermatology services. Provides information about the tournament which is played in Scottsdale, Arizona each January and formerly known as the Phoenix Open. Includes details about the course, tickets, and pictures. Hunter/Jumper equestrian training facility in Scottsdale, Arizona. Competing on a local, national and international level. Provides current show schedule. Located in Scottsdale. Offers hiking, mountain biking, and rafting trips as well as tours to the Grand Canyon. Also rents bikes and has a bike shop. Standing black tobiano at stud. Includes sales list, photos, and profiles of horses. Offers T-Shirts for sale. Located in Scottsdale. Offers gynecological & obstetrical services. Includes glossary of gynecological terms. Located in Scottsdale. Straight Egyptian Arabian bloodstock based on Ruminaja Ali bloodlines. Sale offerings and farm information. Scottsdale, Arizona. Two championship golf courses in Scottsdale. Online tee time registration, facilities, event calendar, and dining. Providing non-medical living assistance for seniors living in the Phoenix or Scottsdale Arizona metropolitan areas. Specializing in one to one companionship. Operates in Phoenix and Scottsdale, Arizona and Aspen and Snowmass, Colorado. Also provides flight training, advertising, and balloon sales. Dr. Alan Miles offers traditional and complementary treatments in Scottsdale, with details of procedures, product sales, and professional background. Offering practice management programs, seminars and workshops. Includes a schedule and a registration form. Located in Scottsdale, Arizona, United States. Travelogue of 1341 mile solo trip from Mt. Hood, OR to Scottsdale, AZ on a recumbent in late Summer, early Fall of 2001. Route, journal, data, photographs, gear, and contacts. Offers complete veterinary and surgical care for dogs, cats, exotics, and small pets. Online tour, newsletter, profiles of their staff, and news. Scottsdale. Breeder of many species, including, African Greys, amazons, caiques, cockatoos, conures, eclectus, lories, macaws, parakeets, pionus, poicephalus, and toucans. Located in Scottsdale. Provides general information including registration, key dates, ages, boundaries, volunteers and sponsors. Also includes game results and details about the Challenger Division. In District 6 and located in Scottsdale. Offering Training, boarding, and both Saddleseat and Western performance lessons, also breeding Arabians and half-Arabs. Located near Scottsdale at Cave Creek. Personal coach, Kathy Gates, helps clarify goals and designs a customized strategy for each client. By telephone or email. Based in Scottsdale. Michael Cronin, ND, licensed physician practicing prolotherapy solutions for traumatized joints, chronic pain, arthritis & unresolved injuries located in Scottsdale, Arizona. General horsemanship training through seminars utilizing Rays accelerated learning system (ACCEL). Includes description of the ACCEL principles and testimonials from students.Scottsdale, Arizona. Provides general information including registration, key dates, ages, local rules, volunteers and sponsors. Also includes field locations and details about the Challenger Division. In District 6 and located in North Scottsdale. Travel highlights of American West tours into Native American communities. Scottsdale, Arizona operators. Providing esthetics education and training at both the student and instructor levels while providing day spa services to the public. Degree programs in Oriental Medicine, Acupuncture, and Chinese Herbology. Scottsdale, Arizona. Arizona Jeet Kune Do Continuing the Pursuit of Truth in Combat. AZJKDis an organization based in Scottsdale, Arizona dedicated to pursuing the concepts and practices founded by the late Sigung Bruce Lee. Offers lessons, training, boarding, and summer camps. Includes list of services, instructor profile, horses for sale, newsletters, rates, and photos. Located in Scottsdale. Offers information on high adventure activities this post participates in, including Philmont. Information for users on how to join as well. Arabians and Half-Arabians for sale. In Scottsdale. A pet visitation therapy program serving some 16 health care centers in Scottsdale, AZ. The benefits of visits. How to start a similar program. Some members teach pet care to second graders. Scottsdale, Arizona High Adventure Explorer Scouts Post. An integrative medical center applying complementary to traditional medicine. Includes information on therapies, articles, statistics, nutrition and facility location/contacts. Located in Scottsdale. Youth soccer club, based in Phoenix and Scottsdale, AZ, hosting teams and a nationally prominent soccer tournament each February. A comprehensive radiation treatment center located in Scottsdale. The Center provides both external and internal (brachytherapy) treatments to cancer patients. Ki Society affiliated dojo teaching Shin Shin Toitsu style aikido in Scottsdale. Seminars, class schedule, reading list, and general information. Alan Christianson, N.D. provides information about integrative health care. Clinic located in Scottsdale, Arizona. Plastic surgeon, Robert Spies, MD, offers the expertise and ethics patients seek today, specializing in approved and safe cosmetic and plastic surgery procedures. Mesa and Scottsdale offices. Full-care boarding, showing, and training facility specializing in Hunter, Jumper, and Equitation training for beginning through advanced horses and riders. Features show schedules and results, trainer biographies, horses for sale, and links. Located in Scottsdale, Arizona. Sponsored by the Arabian Horse Association of Arizona and promoted as one of the largest Arabian horse shows in the country. Extensive information on the show, exhibitors, results, accommodations, and patrons. Sponsors the Scottsdale Arabian Horse Show at West World. This annual Arizona event is one of the largest arabian horse shows in the country. Includes club history, membership information, local farm list, breed information, and youth news. Also features information about the annual Scottsdale Arabian Horse Show, Signature Stallion Auction, and the Fall Festival and Futurity Show. Provides search engine submission and registration. Scottsdale, Arizona. Provides full service consulting to residential and small business owners. Flash, Java, and PHP freelance web design services. Located in Scottsdale, Arizona. Provides search engine and press release optimization and link building campaigns. Scottsdale, Arizona. Independent consultant and systems integrator for performance issues and network security specializing in Sun and Solaris. Located in Scottsdale, Arizona, USA. Web design including e-commerce, advertising, and corporate brand creation. Located in Scottsdale, Arizona, United States. Two locations adjacent to Scottsdale. Contract Bridge clubs and tournaments in the Phoenix, Scottsdale, Mesa area. Meets on the 1st Thursday, 7:00 PM (except July and August). Officers, calendar, trestleboard and more. 280 Scottsdale Bible Church Scottsdale. Scottsdale. Announcements, service times, sermon outlines, pastors biographies, calendars, information on ministries, history, location, and information on the Walk Worthy Bookstore. 281 Mosaic Bible Church Scottsdale. Scottsdale. A church planted by Scottsdale Bible Church. Includes service times and location, vision, and contact details. scottsdale personal injury law firm. Map, service times, and upcoming events. scottsdale law office, offering estate planning services. Class schedule, illustration of 26 poses. scottsdale attorney focusing on drunk driving defense and licensure matters. general practice with offices in phoenix and scottsdale, serving businesses and individuals. business firm with offices in phoenix and scottsdale. services for criminal defense, personal injury and family law, from offices in scottsdale. wedding ceremonies, professional consulting and coordinating in phoenix, tucson, sedona, and scottsdale. Site includes contact information, worship schedule, and staff directory. scottsdale, arizona firm offering professional mediation, arbitration and other neutral services. services for personal injury and medical negligence from offices in scottsdale. Meets on the 2nd Tuesday, 7:00 PM. Dinner at 6:00 PM. Trestleboard, messages, calendar, officers and more. patent agent with technical expertise in rf, dsp, communications, electronics, and software. scottsdale, arizona. 300 CitiChurch International North Scottsdale. North Scottsdale. Apostolic. Information on ministries, events, and beliefs as well as articles and an online store. Presents terror with ghoulish delights. Includes dates and times. Located in Scottsdale. Scottsdale. Contact information, Mass schedule, staff directory, youth page. 303 La Casa de Cristo Lutheran Church Scottsdale. Scottsdale. Contains worship schedule, newsletter, calendar, study opportunities, location, and contacts. Scottsdale apartments offering an independent living community with a wide range of services on the senior campus. scottsdale law firm, offering services for personal injury cases, and consumer claims of bad faith against insurance carriers. scottsdale firm offering services as a mediator, and representing clients in personal injury cases, construction, and commercial disputes. Experience Alices House of Nightmares, the 3-D Fear Factory, Castle of Darkness, and Goldminers Revenge. Located in Scottsdale. multidisciplinary association of professionals, with backgrounds in product, facility, workplace and job design, manufacturing, and safety. based in scottsdale, arizona. Affirming congregation in Scottsdale, Arizona. Pentecostal-style. Yoga instruction and massage therapy spas. Scottsdale. Church information, calendar, ministries, staff, map and contact. services for personal injury, family law, estates, traffic violations, landlord-tenant matters and real estate, from offices in phoenix and scottsdale. A friendly and active church family made up of people who want to make a difference with their lives. 317 Coolwater Christian Church Scottsdale. Scottsdale. Includes contact information, service schedule, directions to the church, and sermons in PDF format. Scottsdale. Newsletter (in PDF), calendar, map, FAQs, information on the churchs ministries and activities. Archive of sermons in PDF, RealAudio, and WMA formats. Site requires frames. offers medical malpractice services. includes philosophy, qualifications, pro bono services, and contact information. based in scottsdale. Descendants of William Douglas Webb as compiled by Betty Jo Webb from Scottsdale, AZ USA. offering assistance with real estate, construction, land development, civil litigation, commercial transactions, asset protection, and alternative dispute resolution, from offices in telluride, and in scottsdale, arizona. All-volunteer, privately funded charitable organization dedicated to reducing the number of homeless cats and other companion animals. Descriptions of available pets and volunteer opportunities. scottsdale law firm, offering services for matters including consumer law, class actions, estate planning, real estate, business law, litigation and immigration. Announcements, service times, sermon outlines, pastors biographies, calendars, information on ministries, history, location, and information on the Walk Worthy Bookstore. scottsdale firm, handling virtually all types of disputes, including insurance law, business and contract disputes, real estate disputes, and hospitality law. All-volunteer, privately funded charitable organization dedicated to reducing the number of homeless cats and other companion animals. Includes photos of available pets and volunteer opportunities. a crematory and gardens located in scottsdale, az. includes information about the cremation process, and their history and services. Scottsdale. Information includes contact information, service schedule, and directions to the church. scottsdale firm specializing in estate planning, probate, elder law, and real estate. A church planted by Scottsdale Bible Church. Includes service times and location, vision, and contact details. Yoga classes for beginner, intermediate, and advanced practitioners, also classes for golfers. Private yoga therapy sessions available. A Native family Christian praise band from the Community Bible Church in Scottsdale. Features their Going Home CD, photos, and information about their church. A Native family Christian praise band from the Community Bible Church in Scottsdale, Arizona. Features their Going Home CD, photos, and information about their church. Descendants of Szmerk Abrahamowicz who later adopted the surname Akerman. Compiled by Lowell Joseph Ackerman from Scottsdale, Arizona, USA. Class schedule and information about Bikram yoga and its founder, Bikram Choudhury. Vision Quest Metaphysical Bookstore is one of Arizonas largest with a huge selection of books and gifts. Classes, psychics every day. Rental space and a yoga studio. Located is Scottsdale, AZ. 341 riva yares gallery scottsdale, az. scottsdale, az. contemporary art works from notable modern masters. dsiplaying works from both the santa fe and scottsdale locations. 343 bonner david gallery scottsdale, az. scottsdale, az. featuring a blend of traditional and contemporary art by some of this countrys best known artists. scottsdale, arizona chapter of spebsqsa. information, news and links. Instruction in ballet, jazz, hip-hop, funk, and cheerleading in Scottsdale, Arizona. represents more than 100 galleries. information about special events, art walks, and current shows. 347 trailside galleries scottsdale, az. scottsdale, az. established in 1963. showcases late twentieth and twenty-first-century contemporary art. 348 di tommaso galleries scottsdale, az. scottsdale, az. quality fine art of the american west: oils and bronzes. another location in jackson, wyoming. 349 1310 kxam various topics. various topics. featured programs, weekly schedule, web cam of studio, contests and area links. scottsdale, arizona. page with description of frank lloyd wrights home in scottsdale, arizona, with links to related resources. 351 legacy gallery scottsdale, arizona. scottsdale, arizona. representing the works of many nationally known artists like trevor swanson, jerry venditti and william ahrendt. 352 jk dooley studio scottsdale, az. scottsdale, az. vibrant colors and intrincate details are the hallmark of jk dooleys watercolors, featuring arizona ranch and rodeo life. Guitars and basses. Models and price list, warranty details, history and dealer finder. Located in Scottsdale, Arizona, United States. home to more than 100 art galleries, the area comes alive with artwalks featuring new art exhibits, free opening night receptions, and live entertainment. scottsdale, az gallery offering contemporary original and graphic art, framing services also available. Schedules, films, ticket information, entry forms and contact information. A very popular comedy which has played in Scottsdale for more than three years which puts you as student in an adult catechism class. 359 american fine art gallery scottsdale, az. 360 bentley gallery scottsdale, az. scottsdale, az. gallery specializing in contemporary art. featured artists include arends, bates, baumgardner, beerman, blain, and carlson. scottsdale, az contemporary fine arts gallery representing artists as well as offering artwork for sale on the secondary market. scottsdale, az gallery offering contemporary art from diverse ethnic cultures, and select asian antique furniture, objects and reproductions. scottsdale, arizona artists create large scale, outdoor murals painted on cinderblock or stucco walls, and indoor murals, fine art and digital art upon request. 364 overland gallery scottsdale, az. scottsdale, az. gallery featuring contemporary russian and soviet impressionism and american realism and impressionism. SiteBook Scottsdale City Portrait of Scottsdale in Arizona. 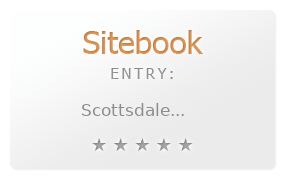 This Topic site Scottsdale got a rating of 3 SiteBook.org Points according to the views of this profile site.